Teletalk Minute Bundle Pack 2018 – Teletalk Talktime Offer 2018 ! Hello Dear, welcome to Teletalk 42 Minutes 13 TK Offer 2018. Today, we are very excited that, the Bangladeshi Government telecommunication company “Teletalk” brings first time 3 minutes bundle offer for their valuable customers, whose name is (serially) Teletalk 42 Minute 13 TK (On-net), Teletalk 100 Minute 44 TK (70 Minutes On-net & 30 Minutes Off-net) and Teletalk 220 Minute 97 TK (150 Minutes On-net and 70 Minutes Off-net). You can easily activate above all Teletalk Minutes Offer 2018 by recharging 13 TK or 44 TK Or 97 TK. At present, many Bangladeshi people are using Teletalk connection, after launching Teletalk Agami Package, Teletalk Bornomala Package and Teletalk Oporajita Package. So, the users are searching Teletalk Minute Bundle Offer 2018. If you are a Teletalk Prepaid customer and want to activate Teletalk mini minutes bundle package in cheap price? First, check the Teletalk 42 MIN 13 Taka Bundle Offer 2018 details information. To activate the Teletalk 42 Min @ 13 TK Offer 2018, Customers need to dial USSD code *111*13# or recharge exact 13 Taka. VAT + SD + SC included in recharge amount 13 Taka. 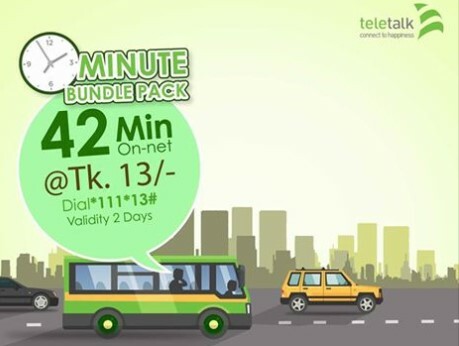 The Teletalk prepaid customers are eligible to enjoy Teletalk On-net 42 Minutes Talktime 13 TK Bundle Offer 2018 as many times as they want and any time of the day. The Validity of Teletalk 13 TK Recharge offer 42 minutes on-net talk time, 2 days. If customers buy the same bundle pack again within the validity, maximum expire time will be considered. Customers use this Teletalk to Teletalk 42 Minutes at only 13 Taka Offer 24 hours. To check the remaining balance of Teletalk Minutes Bundle Package, just dial *152#. Thanks for staying with us a long time and visiting Teletalk 42 Minutes 13 TK Offer 2018 content. If you have any question about the Teletalk Minute Pack 42min@13TK Offer? Just comment here. We reply as soon as possible.